Glioblastoma (GBM) is a primary brain tumor with a 5-year survival rate of ≤5%. We have shown earlier that GBM-antibody-linked curcumin (CC) and also phytosomal curcumin (CCP) rescue 50–60% of GBM-bearing mice while repolarizing the tumor-associated microglia/macrophages (TAM) from the tumor-promoting M2-type to the tumoricidal M1-type. However, systemic application of CCP yields only sub-IC50 concentrations of CC in the plasma, which is unlikely to kill GBM cells directly. This study investigates the role of CC-evoked intra-GBM recruitment of activated natural killer (NK) cells in the elimination of GBM and GBM stem cells. We have used an immune-competent syngeneic C57BL6 mouse model with the mouse-GBM GL261 cells orthotopically implanted in the brain. Using immunohistochemistry and flow cytometry, we have quantitatively analyzed the role of the intra-GBM-recruited NK cells by (i) injecting (i.p.) the NK1.1 antibody (NK1.1Ab) to temporarily eliminate the NK cells and (ii) blocking NK recruitment by injecting an IL12 antibody (IL12Ab). The treatment cohorts used randomly-chosen GL261-implanted mice and data sets were compared using two-tailed t-test or ANOVA. CCP treatment caused the GBM tumor to acquire M1-type macrophages (50–60% of the TAM) and activated NK cells. The treatment also elicited (a) suppression of the M2-linked tumor-promoting proteins STAT3, ARG1, and IL10, (b) induction of the M1-linked anti-tumor proteins STAT1 and inducible nitric oxide synthase in the TAM, (c) elimination of CD133(+) GBM stem cells, and (d) activation of caspase3 in the GBM cells. Eliminating intra-GBM NK cell recruitment caused a partial reversal of each of these effects. Concomitantly, we observed a CCP-evoked dramatic induction of the chemokine monocyte chemotactic protein-1 (MCP-1) in the TAM. The recruited NK cells mediate a major part of the CCP-evoked elimination of GBM and GBM stem cells and stabilization of the TAM in the M1-like state. MCP-1 is known to activate peripheral M1-type macrophages to secrete IL12, an activator of NK cells. Based on such observations, we postulate that by binding to peripheral M1-type macrophages and IL12-activated NK cells, the brain-released chemokine MCP-1 causes recruitment of peripheral immune cells into the GBM, thereby causing destruction of the GBM cells and GBM stem cells. Glioblastoma (GBM) is a deadly form of primary brain tumor with life expectancy of barely 12–15 months from detection, despite the available therapeutic regimens [1, 2]. After surgical excision of the tumor, most GBM patients are treated with radiation plus chemotherapy for a few weeks, which is followed by a chemotherapy regimen that involves a 5-day cycle of 150–200 mg/m2/day temozolomide (TMZ) every 28 days [1, 3]. This 5-day cycle is applied every 28 days as opposed to a prolonged treatment with lower doses (e.g. 75 mg/m2/day) because prolonged TMZ chemotherapy yields severe lymphopenia and suppression of the immune system [4, 5] and development of chemotherapy resistance by the cancer cells [6, 7]. To avoid such side effects, we investigated therapeutic strategies that would rather utilize the body’s own immune system for GBM elimination. Although the xenograft model in nu/nu mice has been used by many groups to study direct anticancer effects of chemotherapeutic agents after implanting human cancer cells, these mice lack T cells and therefore cannot be used to study the effect of the immune system. Therefore, instead of using xenografts in immunocompromised mice, we employed the widely used immunocompetent, syngeneic C57BL6 mouse model with orthotopically implanted mouse glioblastoma GL261 cells [8–10]. The food-derived anticancer agent curcumin (CC) has been shown to eliminate chemotherapy resistance of cancer cells via multiple mechanisms [11–13]. However, CC per se has poor bioavailability in vivo, which may have rendered it ineffective as an anticancer agent in clinical trials [14–16]. Nonetheless, during the last decade we have developed and tested various highly effective delivery forms of CC [10, 17–19]. In one of our recent studies, a bioavailable, phytosomal version of CC (Curcumin Phytosome Meriva (CCP)) (see further details in section “Intra-peritoneal delivery of Curcumin Phytosome Meriva (CCP) into GL261-implanted mice”) [20–23] and also an antibody-linked CC pro-drug caused complete remission in 50–60% of GL261-implanted GBM mice [8, 18]. 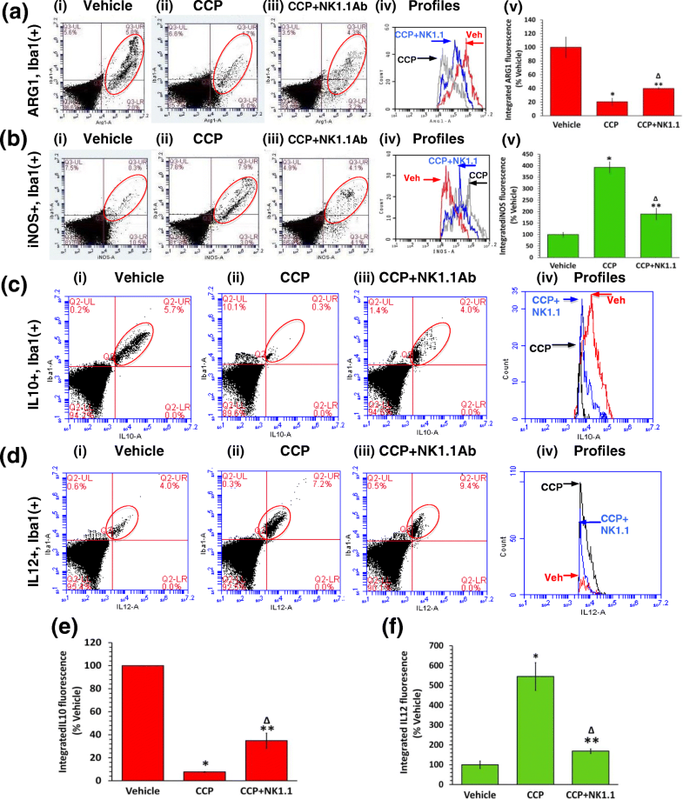 Although CCP exhibited higher bioavailability for CC than free CC, oral gavage of CCP was reported to yield only 0.019 μΜ of CC in the plasma , which was far below the IC50 of CC obtained from in vitro cell-culture studies for GL261 (15 μM) . Yet, CCP treatment caused GBM elimination and rescue of 60% of the orthotopically GL261-implanted mice . As a clue to this surprising finding, we also observed a CCP-evoked dramatic repolarization of tumor-associated microglia/macrophages (TAM) from the tumor-promoting and immunosuppressive M2-like state to the M1 state [8, 10, 24–27]. This observation was important because innate immune cells like microglia and macrophages are the first line of defense against pathogens and tumors . Additionally, it is also known that among the host of immune cells, the brain primarily harbors microglia, which in their pro-inflammatory M1 state can kill tumors directly as well as indirectly by functioning as specialized antigen-presenting cells and via activation and recruitment of other tumoricidal innate immune cells like Natural Killer (NK) cells and peripheral M1-type macrophages [8, 10, 25, 29–31]. Earlier studies have also shown that in GBM, a major portion of the tumor mass is constituted of M2-type TAM [8, 10, 32, 33]. Therefore, skewing the phenotype of TAM to M1-like state by therapeutic interventions holds immense promise in the context of GBM immunotherapy. In light of such information, we elucidate here that in addition to its direct cancer cell-selective activity [10, 34, 35], CC as CCP functions to cause repolarization of the tumor-associated M2-type microglia and intra-tumor recruitment of tumoricidal M1 macrophages and activated natural killer (NK) cells. The NK cells are highly tumoricidal and cause stabilization of M1-type TAM . 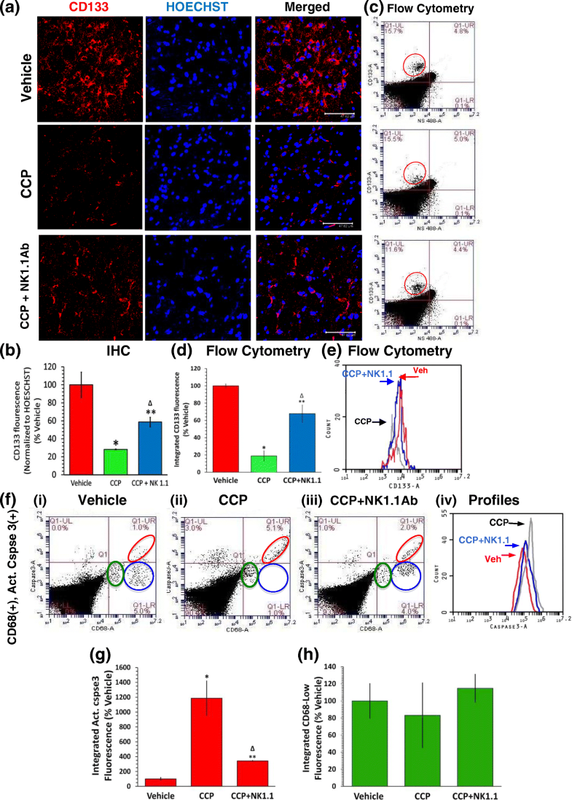 By treating GBM-harboring mice with CCP, with or without eliminating peripheral NK cells, we show that CCP-evoked intra-GBM recruitment of activated NK cells play a major role in augmenting the CCP-mediated repolarization of TAM from M2 to M1-like state along with elimination of GBM cells and GBM stem cells. To our knowledge, this is the first quantitative mechanistic analysis demonstrating the role of NK cells in GBM tumors. It is expected that CCP-mediated activation of these tumoricidal immune cells are primarily responsible in bringing about the immunotherapeutic remission of the GBM-harboring mice . Also, the elimination of GBM stem cells is particularly important because prior studies have shown that the rarely dividing and chemo-resistant GBM stem cells promote radio-resistance [36, 37], and are stimulated to multiply following exposure to ionizing radiation . Consequently, the GBM reappears even after surgical resection and overpowers the already immuno-compromised GBM patient [4, 5]. This study also throws new light on the relationship between the brain tumor microenvironment and the peripheral innate immune system. Inspired by the promises of cancer immunotherapy [39–42], our research elucidates an innovative, safe and simple approach of turning the innate immune system against GBM. Adult C57BL/6 male mice (2–6 months old) were used for our experiments. Animals were bred in the College of Staten Island (CSI) Animal Care Facility and maintained on a 12-h light/dark cycle with ad libitum access to food and water. All animals were handled and used for surgery following an animal protocol approved by the Institutional Animal Care Committee (IACUC) of CSI (CUNY) (approval # 11–008). GL261 mouse glioblastoma cells were cultured according to our earlier reports [8, 10]. GL261 mouse glioblastoma cells (105) were implanted in mice according to our earlier report on day 1 [8, 10]. Our earlier studies have established a condition to generate an orthotopic GBM tumor in 100% of the GL261-implanted C57BL6 mice (a syngeneic mouse model) [8, 10, 18]. Using this method, GBM-harboring mice were generated and then randomly divided into multiple cohorts for Vehicle or drug treatments as discussed below. Although our prior studies had demonstrated the generation of GBM tumor by sacrificing parallel groups of GL261-implanted mice, in the experiments included here, during drug treatment, the experimenter was completely blinded from the actual status of a GBM tumor in any GL261-implanted mouse placed in any of these cohorts. After extrication of the GBM-harboring brains from all the groups (as described below), all the brains were subjected to near-IR scanning to ensure the presence of established tumors (as detailed below) [8, 10, 18]. On day 11 from implantation of 105 GL261 cells (on day 1), each mouse in the CCP + NK1.1 group received intra-peritoneal infusion of NK cell-neutralizing anti-NK1.1 antibody (PK136) (Mouse IgG) (BD, Catalog# 553162) (100 μg). Mice in the other two groups (Vehicle and CCP) received intra-peritoneal injection of a mixture of normal mouse immunoglobulins (Invitrogen, Catalog# 31881) (100 μg). As a proof of NK cell elimination, GBM mice from a fourth group, dubbed ‘NK1.1’, received the NK cell-neutralizing anti-NK1.1 antibody (PK136) (i.p., 100 μg) on day 11, followed by Vehicle (PBS). After five injections of Vehicle or CCP, each mouse was sacrificed and the GBM brain tumor was divided into two parts for immunohistochemistry (IHC) and flow cytometry analysis. On day 11 and day 14 from implantation of 105 GL261 cells, each mouse in the CCP + IL12Ab group received intra-peritoneal infusion of the IL12-neutralizing Anti-IL12 (p40/p70) antibody (rat IgG) (BD, Catalog# 554475) (100 μg per mouse) [27, 29]. Mice in the other two groups (Vehicle and CCP) received a mixture of normal rat immunoglobulins (100 μg, Thermo Fisher Scientific, Catalog# 31888) and subsequent reagents from day 12 (Vehicle or CCP) similar to the earlier NK1.1Ab treatment experiment. After five injections of Vehicle or CCP, each mouse was sacrificed and the GBM brain tumors were divided into two parts for IHC and flow cytometry analysis. Curcumin Phytosome Meriva (CCP) is a formulation with higher bioavailability of curcuminoids (CC) than free CC, prepared by allowing a defined mass of CC to bind (in an organic solvent) to an equimolar mass of phosphatidylcholine (PC) through hydrogen bonding between the hydroxy groups of CC and the polar head group of PC. Upon removal of the organic solvent and dispersion in an aqueous medium the hydrophobic side chains of PC were expected to wrap around the hydrophobic domains of CC to keep it protected and improve the stability and bioavailability of CC in vivo [20, 22, 23]. The commercially available CCP capsule (each containing 500 mg of solid) contained 96 mg of PC-bound CC along with excipients . For the long-term experiments that resulted in rescue of GBM mice, intra-peritoneal (i.p.) administration of CCP was performed according our earlier report . For the short-term experiments, daily intra-peritoneal (i.p.) administration of CCP was initiated from day 12 and continued until day 16. Each 30-g mouse received i.p. injections of sterile PBS (Vehicle group) or a CCP emulsion (for the cohorts “CCP”, “CCP + NK1.1Ab”, and “CCP + IL12Ab”) containing 2 mg of CCP in 200 μl of PBS every 24 h for five days. CCP was dispersed by vortexing vigorously in 200 μl of sterile PBS, the insoluble solids were allowed to settle for 2 min, and then the translucent supernatant was used for i.p. injection into each mouse. Dylight800-CD68Ab was synthesized according to our earlier report [8, 10]. To monitor tumor load, each mouse was anesthetized, intranasally (IN) treated with the Dylight800-CD68Ab adduct (containing 60 μg (400 pmole) of CD68 antibody (CD68Ab)) on day 16 (post-implantation) as described earlier [8, 10], and then scanned after 24 h (following anesthesia) using the Odyssey near-IR scanner (LI-COR Biosciences, Nebraska). The Dylight800 fluorescence (tumor load, pseudocolored green) and the enhanced autofluorescence of the brain tissue (pseudocolored red) were imaged to ensure the presence of established tumors in all experimental groups [8, 18]. Thus, The combination of green and red fluorescence at the tumor site appeared as yellow. The tumor tissue along with the peripheral areas were extricated and processed for further analyses as described below [8, 10]. The IHC part of the established GBM obtained from the day-17 brain was fixed in 4% paraformaldehyde (PFA), soaked in 30% sucrose, and coronal sections (30 μm) were prepared [8, 10, 18]. In both the long-term and short-term studies, randomly chosen sections were subjected to a pre-immunostaining antigen-retrieval process using formamide:2xSSC (1:1) as reported earlier  except for Iba1/IL12/IL10 staining experiments. Antigen-retrieval for the Iba1/IL10/IL12 sets were performed by incubating the sections in 0.1% (w/v) pepsin (Fisher, AC417071000) dissolved in 0.01 N HCl for 20 min at room temperature, followed by two PBS washes. After blocking overnight at 4 °C in the blocking solution (PBS containing 0.1% Triton X-100 and 10% rabbit serum or 3% goat serum depending on the source of the secondary antibody), the sections were treated overnight with primary antibodies against: Iba1 (goat IgG) (C20) (sc28530) (1:50), STAT3 (rabbit IgG) (sc-7179) (1:100), P-Tyr705-STAT3 (goat IgG) (sc-7993) (1:100), NKp46 (rabbit IgG) (sc-292,796) (1:100), IL12p40 (rabbit IgG) (sc-7926) (1:100), IL10 (goat IgG) (sc-1783) (1:100), anti-STAT1 (rabbit IgG) (sc-592) (1:100), anti-P-Tyr701-STAT1 (mouse IgG) (sc-8394) (1:100), anti-iNOS (rabbit IgG) (NOS2 sc-651) (1:100), anti-ARG1 (rabbit IgG) (sc-20,150) (1:100), anti-CD133 (goat IgG) (sc-19,365) (1:50), anti-Sox-2 (mouse IgG) (sc-365,823) (1:50), anti-RM0029-11H3 (macrophage marker) (rat IgG) (sc101447) (1:50), and MCP-1 (Rabbit IgG) (Fisher #PA1–22488) (1:200). All antibodies were diluted in PBS containing 2% goat serum or 2% rabbit serum in 0.1% Triton X-100 (GRT-PBS). Samples which eventually received only 2° Ab (‘2° Ab controls’, negative controls) were kept overnight at 4 °C in the blocking solution. After washing three times with PBS, the respective secondary antibodies (Alexa Fluor 488 goat anti-rabbit (green), Alexa Fluor 568 goat anti-rabbit (red), Alexa Fluor 633 rabbit anti-goat (far red, pseudocolored purple), Alexa Fluor 633 goat anti-rabbit, Alexa Fluor 633 goat anti-mouse, Alexa Fluor 568 rabbit anti-goat, Alexa Fluor 568 goat anti-mouse) (Invitrogen), and goat anti-rat-phycoerythrin (red) (sc3740) (1:1000 dilutions in GRT-PBS) were added to wells containing the respective primary antibodies as well as to the 2° Ab controls. Following overnight incubation at 4 °C and three washes with PBS, the sections were treated with HOECHST33342 (10 μg/ml) for 30 min at room temperature, washed three times with PBS, and mounted on microscope slides with Prolong Gold anti-fade mounting fluid (Invitrogen, Catalog# P36930). Confocal Imaging was conducted using a Leica SP2 microscope from multiple randomly chosen fields encompassing regions in and around the tumor (for all the samples of all the groups from the short-term study and the ‘Vehicle’ samples of the long-term rescue study), and scar-tissue region (for the ‘CCP treated and rescued’ samples of the long-term rescue study) . ImageJ was used to quantify the fluorescence intensities and the intensity for each marker was normalized to HOECHST33342 intensity (blue). Since STAT3 and STAT1 displayed both induction as well as phosphorylation-mediated activation, the HOECHST-normalized staining intensities were expressed both as P-STAT3/STAT3 and P-STAT1/STAT1 as well as P-STAT3/HOECHST and P-STAT1/HOECHST. Wherever necessary, co-stained cells (single, double or triple-stained) were counted and analyzed using ImageJ and the data was expressed as percentage of total count for the Vehicle group. For the 5-day study, the brains of the GL261 implanted, GBM mice from the four groups (Vehicle, CCP, CCP + NK1.1, and CCP + IL12Ab) were extricated (after anesthesia) on day 17 (from implantation) and without fixing and one-half of each GBM brain was rinsed twice with PBS. Next, only the cells from the tumor area (and surrounding tissue) from these unfixed brains were dissociated by mild trypsinization and single-cell suspensions were generated and fixed (in PFA) according to our earlier reports [8, 10]. Around 2 million fixed cells from each animal were used for immunostaining as described earlier for flow cytometry [8, 10, 27]. After each antibody treatment, the cells were pelleted and resuspended in washing buffers. Antibodies against Iba1 (C20) (1:50), iNOS (rabbit IgG) (NOS2 sc-651) (1:100), ARG1 (rabbit IgG) (sc-20,150) (1:100), NKp46 (1:100), IL12p40 (1:50), IL10 (1:50), CD68 (H-255) (Rabbit IgG) (sc-9139) (1:50), Active-Caspase3 (Asp175) (Rabbit IgG) (CST #9661) (1:100), and CD133 (1:50) were used for staining. Cells treated with the secondary antibody alone were used to set the threshold. Flow cytometry was performed as reported earlier using cells from the high forward- versus side-scatter region (Additional file 1: Figure S1C) [8, 10, 27]. The double-stained fluorescent events from CD68(+)/Iba1(+), ARG1+/Iba1(+), iNOS+/Iba1(+), IL10+/Iba1(+), IL12+/Iba1(+), and CD68(+)/Active-Caspase3(+) cells appeared as sub-populations in the upper right (UR) quadrant within the coordinates 520 nm (green for CD68, ARG1, iNOS, IL10 and IL12) (FL1-A) and 580 nm (red for Iba1 and Active-Caspase3) (FL2-A). Single-stained fluorescent events from the scatter plots and from Nkp46(+) and CD133(+) cells appeared as sub-populations in the upper left (UL) quadrant within the coordinate 580 nm (red) and lower right (LR) quadrant within the coordinate 520 nm (green). Integrated fluorescence intensity was measured (for comparison between groups) by multiplying the number of positive events (single stained or double stained cells) by the mean fluorescence intensity. Integrated fluorescence: The fluorescence profiles presented in the flow cytometry data are a combination of altered fluorescence intensity per cell and a change in the number of cells expressing a specific fluorophore [10, 27]. For example, the profiles in Fig. 4a(iv) and b(iv) indicated that a specific population of Iba1(+) TAM, which was also ARG1+, dramatically lost ARG1 fluorescence in the CCP-treated mice (a decrease in ARG1 intensity shown by a lateral shift in the ARG1 peak in Fig. 4a(iv)), while another population of possibly M0 cells was activated into an Iba1(+), iNOShigh state (an increase in iNOS fluorescence intensity per cell in Fig. 4b(iv)). In contrast, the fluorescence profile for IL10 in Iba1(+) TAM in Fig. 4c(iv) showed a less dramatic CCP-evoked lateral shift in IL10 fluorescence intensity per cell, but it was accompanied by a dramatic decrease in the IL10 peak area, which represents the number of events or cells. Therefore, for uniformity, we expressed our data as “integrated fluorescence” (fluorescence per cell x the total number of events (cells)) [10, 27]. Two-tailed t-tests with unequal variance were used while comparing two groups and one-way ANOVA was used to compare among three groups. p ≤ 0.05 was considered as significant. We have recently reported that the GBM tumors that kill the Vehicle-treated mice harbor tumor-promoting arginase1 (ARG1)high, inducible nitric oxide synthase (iNOS)low M2-like microglia/macrophages (TAM). In sharp contrast, the mice rescued from GBM by both antibody-linked CC and CCP contained ARG1low, iNOShigh M1-like TAM in the scar tissue . In this report, we also demonstrated that CCP induces the transcription factor STAT1, which is known to trigger iNOS and IL12 synthesis in the TAM [27, 43]. Here, we investigate the possibility of NK cell recruitment and its role in this CCP-evoked M2➔M1 repolarization of the TAM and the cytokine balance occurring in the GBM tumor microenvironment [27, 44, 45]. The transcription factor STAT3 is known to cause IL10-mediated suppression of both STAT1 as well as STAT1-mediated induction of the anti-tumor cytokine IL12 [8, 27, 46]. Our IHC analysis demonstrated that the GBM tumor in the Vehicle-treated mice at death harbored high levels of activated STAT3 (P-Y705-STAT3 or P-STAT3) (Additional file 1: Figure S1A and B), but the scar tissue sections from the CCP-treated and rescued mice displayed a 98% suppression of P-STAT3 (Additional file 1: Figure S1A and B) in the Iba1(+) (activated) TAM. The overall suppression of P-STAT3 was due to a combination of suppressed STAT3 expression (Additional file 1: Figure S1C) and inhibited STAT3 phosphorylation (Additional file 1: Figure S1D). Based on earlier studies [27, 46], we expected that CCP-evoked inhibition of STAT3 in the TAM would prompt suppression of IL10 and induction of IL12, and IHC analysis yielded the expected results (Additional file 2: Figure S2A-C) . On measuring the expression of NKp46 that marks activated NK cells, we observed that the GBM tumor in the Vehicle-treated mice harbored very few activated NK cells, but the scar tissue region of CCP-treated and rescued mice displayed a large number of NK cells and an 800% increase in NKp46 fluorescence compared to the Vehicle-treated group (Fig. 1a and b) [10, 27]. We next studied the role of the NK cells in the observed CC-evoked M2➔M1 repolarization of TAM. To achieve this, we used a short-term regimen of CCP treatment, which was insufficient to cause complete elimination of the GBM. Earlier studies have shown that the NK cell surface antigen NK1.1 (PK136) is a highly selective NK-cell marker in C57BL/6 mice (the mouse strain used in this study) [47–49]. So, one set of randomly chosen GBM mice scheduled for CCP treatment was first injected with the NK1.1 (PK136) antibody (NK1.1Ab) to eliminate the peripheral NK cells as reported earlier [29, 50]. The CCP treatment was conducted from the following day on one of two mouse immunoglobulin (MIg)-treated sets (CCP group) and the NK1.1Ab-treated set (CCP + NK1.1Ab group) for five days. The second MIg-treated set received PBS (Vehicle group) for five days. This was followed by sacrifice and analysis of the GBM tissue (Additional file 3: Figure S3B and Fig. 2a). Earlier clinical studies of patient-derived GBM samples showed that high CD68 expression was a prognostic marker for GBM . Our previous studies have also established that GBM cells express high levels of CD68 both in vitro and in vivo but are Iba1(−) [8, 10, 18], whereas the microglia express much lower levels of CD68 . In these studies, murine and human GBM cell lines and xenograft explants showed high CD68 expression in vitro [8, 10, 18]. Additionally, the entire tumor core area of the Vehicle-treated GL261-implanted GBM mice showed pronounced expression of CD68 (CD68high/Iba1(−) GBM tumor cells), whereas the scar tissue area of the CCP-treated and rescued mice was devoid of the CD68high (GBM tumor cells) population. Moreover, staining of the GBM brains with the dylight800-CD68Ab adduct clearly labeled the tumors [8, 10, 18]. As mentioned earlier, intra-GBM TAM express relatively low levels of CD68, while displaying high levels of Iba1 (CD68low/Iba1(+) TAM) [8, 10]. This differentially-expressed CD68 molecule has been exploited by our group as a targeting marker for GBM therapy to cause rescue of a significant number of mice with established tumors [8, 18]. Implantation of 105 GL261 cells on day 1 resulted in tumors in all the mice of all the groups on day 17, esp. large tumors in the Vehicle-treated mice (Additional file 3: Figure S3A) . Following dissociation of these tumor cells by mild trypsinization and staining for CD68 and Iba1, the cells were analyzed by flow cytometry in the high forward- and side-scatter range (Additional file 3: Figure S3C) [8, 10, 27]. Two clearly divided populations of CD68(+) cells were identified (Additional file 3: Figure S3D). The larger population of presumably GBM cells was Iba1(−) and CD68high, whereas the Iba1(+) but CD68low cells were expected to be the TAM (Additional file 3: Figure S3D-F) . The integrated CD68 fluorescence (IF) (mean fluorescence per cell x total number of cells in the population) in the CD68high population was 780% of that in the CD68low population (a 680% increase) (Additional file 3: Figure S3E and F). Five days of treatment of the GBM mice with Vehicle (PBS with MIg pretreatment), or CCP with either MIg pretreatment (CCP group) or NK1.1Ab pre-treatment (CCP + NK1.1 group) (Fig. 2a) caused a 200% increase in activated (NKp46(+)) NK cells in the GBM tumor of the CCP- but not CCP + NK1.1Ab-treated mice (Fig. 2b and c). Virtually no NKp46(+) cells were detected in the NK1.1Ab-pretreated mice (Fig. 2b, third row and c). Parallel flow cytometry analysis confirmed that CCP-treatment elicits a dramatic (190%) increase in NKp46 IF, demonstrating infiltration of activated NK cells into the GBM tumor. This CCP-evoked NK infiltration was virtually eliminated the NK1.1Ab-treated mice (Fig. 2d-f). Due to the lack of NKp46(+) NK cells in the ‘Vehicle’ group and since it is known that the blood-brain barrier (BBB) impedes the intra-brain entry of large molecules like antibodies, it is most likely that the peripheral infusion of the NK1.1Ab depleted only peripheral NK cells in the ‘CCP + NK1.1’ group to abrogate CCP-induced intra-GBM recruitment of activated NK cells . As a negative control for CCP and proof of NK1.1-mediated NK cell neutralization, the flow cytometry profile for NKp46 staining of the NK1.1 group showed negligible quantities of intra-GBM NK cells (green line), which was almost identical to the NKp46 profile of the CCP + NK1.1 mice (blue line) (Fig. 2e). This NK cell depletion further demonstrated the high specificity of the peripherally administered NK1.1Ab toward the NKp46(+) NK cells. Similar to the complete blockage of intra-GBM recruitment of NK cells in mice peripherally injected with the NK1.1 antibody (Fig. 2), blocking peripheral IL12 signaling by injecting GBM mice with an IL12 antibody virtually eliminated NK cell recruitment into the GBM tumor (Additional file 4: Figure S4A-C) [27, 29]. This confirmed that peripheral IL12-mediated signaling played a major role in the recruitment of peripheral NK cells into the GBM tumor. In addition to NK cell influx, we observed recruitment of activated macrophages into the GBM tumor equally in both CCP-treated and CCP + NK1.1Ab-treated mice, which ruled out any role of activated NK cells in the intra-GBM recruitment of macrophages (Fig. 3). The activated macrophages were identified by selective staining with the RM0028-11H3 antibody [18, 53]. Iba1 staining, however, marked both activated microglia and macrophages [8, 18, 27]. We next tested the involvement of the NK cells in CCP-evoked inhibition of STAT3 expression and activation in the TAM. Whereas mice receiving five days of Vehicle treatment showed high levels of P-STAT3 as well as STAT3 in the Iba1(+) TAM, CCP treatment elicited an overall 88.5% decrease in P-STAT3, and this suppression was only by 61% in mice pretreated with the NK1.1Ab (Additional file 5: Figure S5A and B). Thus it is likely that the difference (88.5–61% = 27.5%) in P-STAT3 inhibition was due to the recruited NK cells. The CCP-evoked 88.5% suppression of P-STAT3 was the combined result of an inhibition of STAT3 (expression) (79%) and suppression of P-STAT3 (activation) (69%) in the Iba1(+) TAM (Additional file 5: Figure S5A-D). Both STAT3 as well P-STAT3 levels were partially restored in the Iba1(+) TAM in mice receiving CCP + NK1.1 (Additional file 5: Figure S5A-D). The Vehicle-treated mice showed low levels of STAT1 and very little P-STAT1 whereas the CCP-treated mice displayed a 1286% increase in P-STAT1 in the Iba1(+) TAM. In contrast, the NK1.1Ab + CCP-treated mice showed only a 300% increase in P-STAT1 (Additional file 6: Figure S6A and B). Thus, the difference in P-STAT1 induction (1286–300% = 986%) was likely due to the recruited NK cells. The overall CCP-evoked increase in P-STAT1 was due to a combination of STAT1 induction (Additional file 6: Figure S6C) and STAT1 activation (P-STAT1 normalized to STAT1) (Additional file 6: Figure S6D) and both of these effects were partially reverted in the CCP + NK1.1Ab group. The CCP-evoked inhibition of STAT3 and induction of STAT1 in the Iba1(+) TAM (Additional file 5: Figure S5 and Additional file 6: Figure S6) would be expected to have their respective downstream effects on the synthesis of the cytokines IL10 and IL12. As discussed earlier, the transcription factor STAT3 is known to induce both ARG1 and IL10, whereas STAT1 has been reported to boost iNOS and IL12 [29, 46]. Interestingly, the GL261 tumor model is characterized by differential levels of hypoxia, and high hypoxia in turn supports the M2-like TAM in the GBM mass [54–57]. Thus, it was imperative for us to ascertain and compare the overall magnitude of TAM repolarization to the M1 state following different treatments by using dispersed cells from the whole tumor mass as well as the tumor periphery (see methods for further details) [8, 10]. Thus, as shown by flow cytometry, the CCP-evoked suppression of activated STAT3 (P-STAT3) was associated with an 80% inhibition of ARG1 staining in the Iba1(+) TAM (Fig. 4a i, ii, v). Only a 60% decrease in ARG1 was observed in the CCP + NK1.1Ab group (Fig. 4a iii). Thus, the difference (80–60% = 20%) was likely due to the recruited NK cells. A concomitant 293% increase in iNOS was also observed in the Iba1(+) TAM (Fig. 4b i, ii, v). In contrast, the NK1.1Ab + CCP-treated mice showed only an 89% increase in iNOS (Fig. 4b iii and v). Thus, the difference (293–89% = 204%) was likely due to the recruited NK cells. In addition to this repolarization, the integrated fluorescence measurements in flow cytometry showed high IL10 expression by the Iba1(+) TAM in the Vehicle-treated mice, which was suppressed by 92% in the CCP-treated mice (Fig. 4c i, ii, iv and e). In contrast the NK1.1Ab + CCP-treated mice showed only a 65% decrease in IL10 (Fig. 4c iii and e). Thus the difference (92–65% = 27%) was likely due to the recruited NK cells. The high IL10 expression in the Iba1(+) TAM was accompanied by a very low level of IL12 expression in the Vehicle-treated group. However, the IL12 level was boosted by 445% in the CCP-treated mice (Fig. 4d i, ii, iv, and f). In sharp contrast, the NK1.1Ab + CCP-treated mice showed only a 69% increase in IL12 (Fig. 4d iii and f). Thus, the difference in IL12 induction (445–69% = 376%) was likely due the recruited NK cells. To confirm the overall functional phenotype of the TAM and validate the flow cytometry data, we also measured the expression levels of ARG1 and iNOS in the Iba1(+) TAM in the three groups by performing IHC on GBM sections (parallel to the dispersed cells used in flow cytometry analysis, see methods) (Additional file 7: Figure S7). 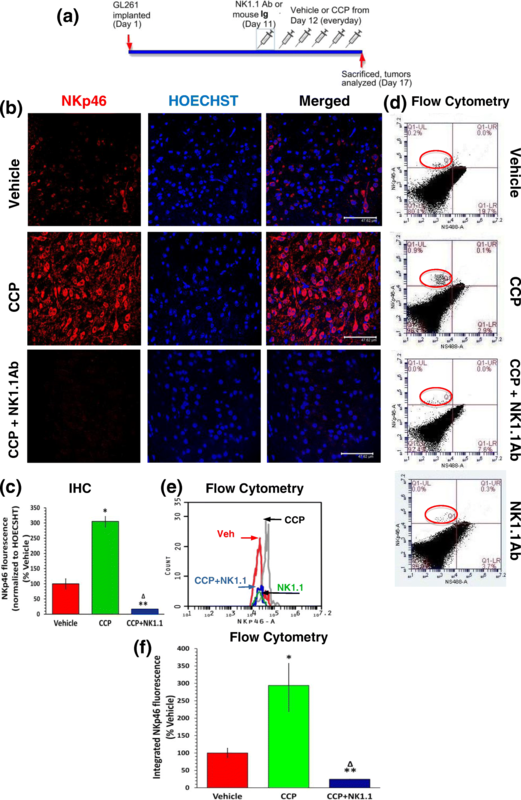 The IHC experiments reconfirmed the flow cytometry results by establishing the pivotal role of the intra-GBM recruited NK cells in the CCP-evoked repolarization of TAM. Similarly, to determine the overall functional polarity of the TAM and to corroborate the flow cytometry data, we measured the expression levels of IL10 and IL12 in the Iba1(+) TAM in the three groups by performing IHC on GBM sections (parallel to the dispersed cells used in flow cytometry analysis, see methods). Results obtained reconfirmed the crucial function of the intra-GBM recruited NK cells in CCP-mediated suppression of IL10 and induction of IL12 in TAM (Additional file 8: Figure S8). We employed IHC and flow cytometry because the M2 and M1 markers are also ubiquitous enzymes (iNOS and ARG1) and cytokines (IL10 and IL12) which can be expressed by other Iba1(−) cell types (non-TAM, including other immune cells) in the GBM tumor microenvironment. Differentiation of such cells from the TAM was possible through IHC and flow cytometry analyses and not by ELISA-based cytokine secretion assays or Western blotting [8, 10]. Since NK cells are known to eliminate both GBM cells as well as GBM stem cells [58, 59], we studied the contribution of the CCP-evoked intra-GBM recruited NK cells in elimination of GBM. IHC analysis of the GBM stem cell marker CD133 [10, 60] revealed a 72% decrease in CD133(+) cells in IHC in the CCP-treated mice. In contrast, NK1.1Ab + CCP-treated mice showed only a 41% suppression of CD133 staining (Fig. 5a, b). Corroboratively, flow cytometry demonstrated an 81% suppression of CD133(+) GBM stem cells in the CCP-treated, but only a 32% decrease in the NK1.1Ab + CCP-treated mice (Fig. 5c and d). Thus, the difference between the CCP and CCP + NK1.1 samples (81–32% = 49%) was likely due to the recruited NK cells. The CD133(+) GBM stem cells are also known to be SOX2 positive [10, 37], and IHC analysis of parallel sections for SOX2 (Additional file 9: Figure S9) corroborated data presented in Fig. 5. Even though the 5-day CCP treatment caused a decrease in tumor load in the GBM mice and this decrease was partially reversed in the NK-cell neutralized groups (CCP + NK1.1Ab and CCP + IL12Ab groups), these changes in tumor load were not statistically significant. It is known that GBM tumor harbors necrotic tissues and edema, which can still remain following therapy-triggered cell apoptosis, contributing to the apparent tumor size . The complete clearance of these dead cells are likely to require much more than five days, as indicated by our CCP-mediated GBM mouse rescue studies where we observed the presence of a scar tissue area at the site of tumor implantation approximately 4 months after discontinuation of CCP treatment . Thus, to verify the role of NK cells in 5-day CCP treatment-evoked apoptosis of GBM cells, we detected a population of CD68high but activated caspase-3(−) (Act. Cspse3(−)) cells (in the blue circle) in the Vehicle-treated mouse tumors (Fig. 5fi and g). In sharp contrast, the tumors in the CCP-treated mice harbored mainly CD68high, Act. Cspse3(+) cells (in the red ellipse) with a very small number of CD68high but Act. Cspse3(−) cells (in the blue circle) (Fig. 5fii and g) . This CCP-evoked 1187% increase in Act. Cspse3(+), CD68high cells was reduced to 343% in the NK1.1Ab pre-treated mice (Fig. 5fiii, iv, and g). By contrast, the CD68low, Act. Cspse3(−) cells (presumably the TAM) remained unaltered in all three groups, signifying that CCP-treatment doesn’t affect the viability of these cells (Fig. 5h). Thus, the difference in the increase in Act. Cspse3(+) cells between CCP and CCP + NK1.1Ab (1187–343% = 844%) was likely due to the recruited NK cells. Elimination of NK cell recruitment through peripheral injection of NK1.1 antibody causes partial reversal of M2➔M1 repolarization (Fig. 4). Since data presented in Additional file 4: Figure S4 show that this NK cell recruitment into the GBM tumor is dependent on peripheral IL12 signaling, we expected that IL12Ab treatment would partially abrogate the magnitude of the M1-type polarization of both macrophages and microglia harbored within the GBM tumor. Corroboratively, the CCP-evoked induction in iNOS in the microglia (RM0029-H3(−), Iba1(+)) (474%) and the (RM0029-H3(+), Iba1(+)) macrophages (498%) was partly eliminated in the IL12Ab-treated mouse tumors (Additional file 8: Figure S8A, B). 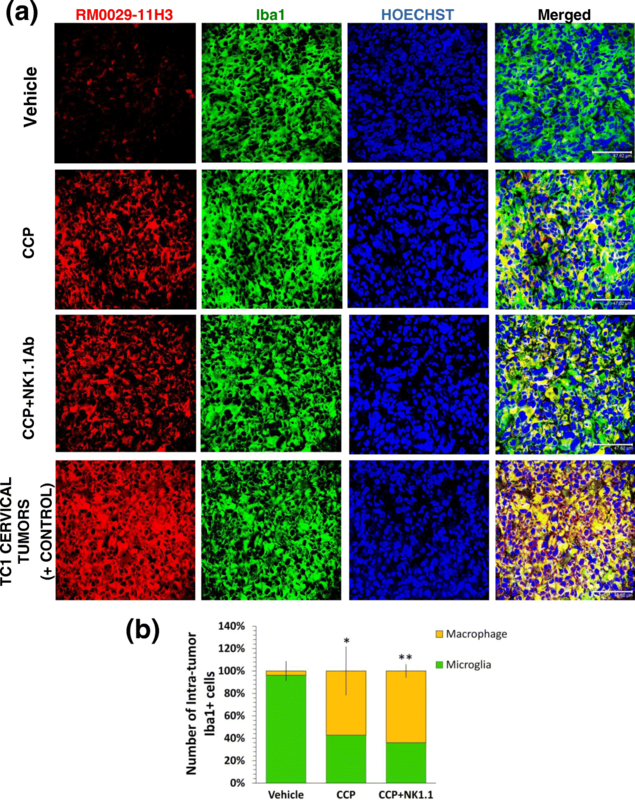 With respect to the Vehicle-treated, the CCP + IL12Ab-treated mice displayed a 242% increase in iNOS in the microglia and a 250% increase in iNOS in the macrophages (Additional file 10: Figure S10A, B). Therefore, the differences (474–242 = 232%) and (498–250% = 248%), respectively for microglia and macrophages were due to the stabilization of M1-polarization of the TAM by the recruited NK cells. Earlier studies have established the chemokine MCP-1 as a marker of M1 macrophages and microglia [62, 63]. MCP-1 is also known to possess anti-tumor attributes and can compromise the BBB to translocate from the brain into the peripheral system to cause recruitment of immune cells such as M1-like macrophages and activated NK cells [31, 45, 64, 65]. CCP treatment in both absence as well as presence of peripheral IL12Ab injection caused a dramatic induction of TAM-associated MCP-1 in the GBM brain (Additional file 11: Figure S11). Therefore, this CCP-induced MCP-1 synthesis in the TAM was not dependent on the infiltration of activated NK cells into the GBM brain. Based on this information, we postulate a likely mechanism of intra-tumor recruitment of M1-like macrophages and IL12-activated NK cells (Additional file 12: Figure S12) in which CCP-induced MCP-1 release from TAM initiates the process of macrophage activation, intra-tumor recruitment, NK cell activation by macrophage-released IL12, and MCP-1-evoked recruitment of activated NK cells into GBM. Our earlier report  and this study demonstrate that CCP treatment affords relatively permanent repolarization of TAM from a tumor-promoting M2-like population to a tumoricidal M1-like milieu in the GBM. Since it is known that activated NK cells are recruited into peripheral tumors and that they also enter the brain under various conditions [29, 59, 66], we asked if CCP treatment triggers intra-GBM recruitment of NK cells and also if the NK cells influence CCP-evoked repolarization of TAM and elimination of GBM and GBM stem cells. We noticed that the scar tissue from the CCP-treated and rescued mice but not the GBM tumor in the Vehicle-treated mice harbor a large number of activated NK cells (Fig. 2). These recruited NK cells were partially responsible for the CCP-evoked suppression of the M2-type markers, such as P-STAT3 (by 27.5%), IL10 (by 27%), and ARG1 (by 20%) in the TAM. Simultaneously, the NK cells were partially responsible for the CCP-evoked dramatic increase in the tumoricidal M1-type markers, such as P-STAT1 (by 986%) and IL12 (by 376%) in the TAM. The consequent IL12-evoked NK activation may amplify and prolong the M1 polarization of TAM in the GBM via IFNγ released by activated NK cells [27, 67], thereby causing a 204% increase in iNOS, which would catalyze the formation of cytotoxic NO inside the GBM (Additional file 2: Figure S2; Additional file 3: Figure S3, Additional file 4: Figure S4; Additional file 10: Figure S10 and Additional file 12: Figure S12) . Finally, the recruited NK cells also account for 49% of the CCP-evoked suppression of CD133(+) GBM stem cells and 844% of the 1187% increase in active caspase-3 in the CD68high GBM cells (Fig. 5). In view of the earlier observation that the GBM stem cells trigger STAT3-mediated activation and proliferation of immunosuppressive M2 microglia/macrophages , anti-GBM-stem-cell and anti-STAT3 activities of CCP (Fig.5, Additional file 9: Figure S9) are likely to be pivotal in the observed CCP-evoked (i) correction of immunosuppression in the GBM microenvironment, (ii) M2➔M1 polarization of the tumor-associated microglia, and (iii) intra-tumor recruitment of M1-like macrophages and activated NK cells [10, 69]. Additionally, anti-GBM-stem-cell activities of TAM and NK cells are also likely to be central to the observed GBM elimination (Fig. 5) [10, 26, 59]. GBM stem cells are known cause tumor recurrence after conventional GBM therapies, so the permanent elimination of these cells is most likely to be crucial for the complete tumor remission of the CCP-treated GBM mice . We observed NK-cell-independent CCP-triggered recruitment of M1-like macrophages into the GBM, such that the TAM were eventually composed of 50–60% of M1-macrophages (Fig. 3). This may partially account for the dramatic M2➔M1 switch in the TAM milieu. But what was the mechanism of intra-GBM recruitment of M1-macrophages and activated NK cells? It is known that MCP-1 (a.k.a. CCL2) is a chemokine marker of M1 microglia/macrophages [70, 71]. IHC analysis of brain sections from the 5-day CCP treatment revealed a peripheral-NK cell-independent, CCP-evoked induction of MCP-1 within the GBM TAM (Additional file 11: Figure S11). This anti-tumor chemokine MCP-1 is known to compromise the blood-brain barrier and exit into the blood stream. It is also known to bind to its receptor (CCR2) on M1-type macrophages and activated NK cells to recruit them to the source of its origin like the brain and tumor mass [31, 45, 64, 72, 73]. Based on such information, we hypothesize that the CCP-induced M1 microglia-derived chemokine MCP-1 exits the brain, triggers a cascade of events to first activate M1-type macrophages, which signal through IL12, activating the NK cells to express CCR2 and bind to MCP-1. M1 microglia-derived MCP-1 thus recruits both cell types (M1 macrophages and activated NK cells) into the GBM tumor (Additional file 12: Figure S12). Immunotherapy approaches using chimeric antigen receptor (CAR) T cell treatment and regulators of T-cell activation (checkpoint inhibitors) have recently come into prominence but such strategies are riddled with limitations and side effects [74, 75]. Although these cancer immunotherapy approaches which focus exclusively on T cells have yielded technically successful treatment protocols for most cancers, only a small percentage of cancer patients have been observed to respond to these treatments [76, 77]. Currently, these conventional cancer immunotherapeutic strategies face unique difficulties and challenges in the context of GBM therapy. Just to name a few, (i) GBM cells and GBM stem cells cause immunosuppression, (ii) the BBB prevents delivery of therapeutic agents into GBM, (iii) the brain harbors very few anti-tumor T cells, and (iv) the absence of a lymphatic system in the brain limits entry of immune cells into the CNS [78, 79]. Perhaps due to such reasons, recent times have seen a heightened interest among researchers to study the relatively untapped innate immune cells like macrophages and NK cells as potential targets for effective cancer immunotherapy . Our findings take us a step further by exploring an alternative, safe strategy to recruit such cells into the brain to eliminate GBM. Thus, we provide here a highly effective immunotherapeutic approach to eliminate GBM tumors. Due to the fact that the peripheral cancers also involve recruitment of macrophages and NK cells, our strategy can eventually become an effective general approach for new-age cancer immunotherapy [10, 27]. CCP is therefore a safe yet promising agent that may combat GBM tumors in patients by recruiting the cells of the innate immune system. Rahman Hussaini and Richard White contributed equally to this work. SM received teaching assistantship from the College of Staten Island (CUNY). We are grateful to Dan Johnson and Tony Gallego (Media Services at CSI) and Lovena David for technical assistance. This project was supported by Professional Staff Congress (PSC)-CUNY grants from cycles 45 and 47. All data generated or analyzed during this study are included in this published article and in its supplementary information. SM and PB conceived, planned and designed the experiments. SM, AF, RH, RW, JB and SY carried out the experiments. All the authors contributed to the analysis of data and interpretation of results. PB and SM took the lead in writing the manuscript. All authors provided critical feedback and helped in shaping the final manuscript. All authors read and approved the final manuscript.